Severe degenerative changes in the head of the capitate. Patients >35y/o are more likely to require revision surgery (fusion). Radioscaphocapitate ligament is the prime stabilizer between the capitate and radius after PRC; must ensure it is preserved during surgery. Well padded touniquet placed high on the arm. Exsanginate the arm with Eschmar bandage, inflate tourniquet to 250mmHg. 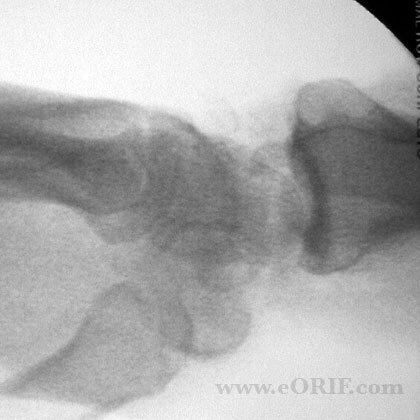 Oblique longitudinal incision centered on radiocarpal joint from ulnar side of radius to the base of 2nd metacarpal. Identify extensor retinaculum. 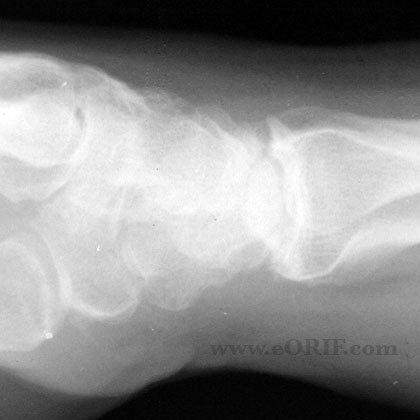 Incise longitudinally, opening the 4th extensor compartment. Preserve cuff of retinaculum for later repair. Isolate and retract extensor tendons with penrose drain. Identify PINin floor of the 4th dorsal compartment and transect proximally. Perform T-capsulotomy centered over scapholunate joint. 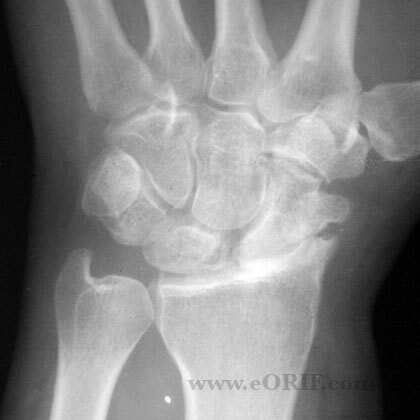 Note dissociation of scapholunate ligament, degenerative changes in radioscaphoid joint etc, Preserved cartilage in capitate. 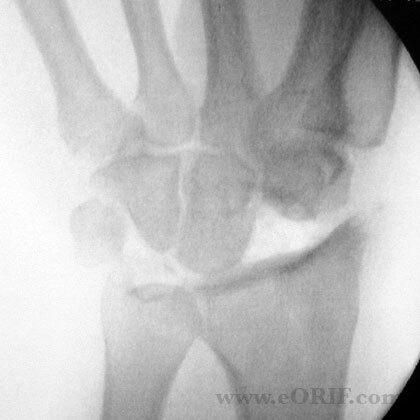 Divide the scaphoid at its waist with in osteotome. Remove the proximal fragment. Excise distal fragment using a threaded Steinmann pin as a joy stick. Verify the integrity of the radioscaphcapitate ligament. Place Steinmann pin in lunate and excise lunate. Place Steinmann pin in triquetrum and excise. If needed radial styloidectomy may be performed with dissection between the 1st and 2nd dorsal compartments. Remove distal 5 to 7mm of radial styloid. Ensure radioscaphocapitate ligament is preserved. Repair capsule to maintain capitate in lunate fossa. Degenerative changes in the radiocapitate articulation. Degenerative changes in the radiocapitate articulation, Stiffness, motion loss, Weakness, CRPS Continued pain, Instability. Post-op: Volar splint in neutral, elevation. 7-10 Days: Wound check, short arm cast. 3 Months:Full activities, may resume manual labor if adequate strength has been achieved. >10year follow-up: 18% failure requiring fusion at an average of seven years. All in patients < 35y/o at the time of the PRC. Average flexion-extension arc = 72°, average grip strength = 91% of contralateral side. (DiDonna ML, JBJS 2004;86A:2359).